TRIO offers a tremendous array of flooring choices for commercial applications. Designed for use in retail, office, hospitality and health care our materials include carpet, wood, vinyl, concrete and more. Custom finishes and logos are our specialty as is an emphasis on the use of sustainable materials. We provide free design services and take-offs. Nationwide installation services are available! From Bamboo to Oak to Exotic Teak and Mahogany, Hickory and Tigerwood. All sustainable hardwood from managed growth forests. Major brands include Shaw, Mohawk, Bealeau, Atlas, Karastan commercial, Durken, Mullican, Colins, and Ackman. From all natural products, P.V.C sheet, solid vinyl stripwood and tile & natural stone linoleum. Office, Health Care, Retail & Residential. Etched, stained and sealed concrete floors are perfect for retail, restaurant and commercial applications. Natures "Natural Flooring" around for over 1000 years newly "Re - discovered." Cork offers exceptional durability and low maintenance. Sisal, coir (cocunut husk), sea grass & jute. All natural fibers used as flooring, area rugs and wall covering. Referred to as "indestructable", rubber is an excellent choice for high traffic areas. Substitute products for marble, granite, and natural stone flooring perfectly suitable for a retail. Unique wide plank laminates offer durability and easy installation at a great price. 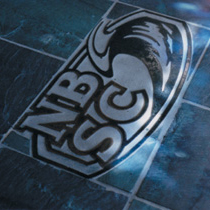 Floor graphics are an ideal method for maximizing the impact of your store’s branding. Please call for pricing.